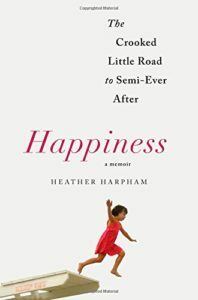 Vacation read #4 was Heather Harpham’s memoir Happiness, which I grabbed on an impulse from my 2017 Book Expo box the night before we left. Harpham, a writer living in New York, meets and falls in love with an author named Brian. They have a strong, passionate relationship that is leading toward permanence, except for one issue they can’t resolve: Heather wants kids and Brian doesn’t. When they accidentally become pregnant, the decision of what to do – and how it will impact their relationship – becomes too much for them to survive. Heather moves home to California to have the baby, leaving Brian in New York. Their daughter Gracie is born outside San Francisco, and from the start it’s apparent that she is suffering from a mysterious blood disorder. Within the first few weeks of her life, Gracie received a blood transfusion, a procedure she requires every three to four weeks to help get oxygen to her body. Heather handles Gracie’s condition and treatments solo, with help of her mother and some longtime friends, bearing the emotional and physical burden of caring for a sick infant. Brian finally flies out to California to meet his daughter a few months later, and he slowly backs his way into fatherhood. Ultimately, Heather and Brian reconcile, and are then faced with the question of whether to have another child who might be a genetic match to provide bone marrow for Gracie. Given their history, this is a complicated question, but one that is quickly answered when Heather becomes unexpectedly pregnant with their son, Gabe. From there they must decide whether to transplant his marrow into Gracie, and where, and how they will get through it, emotionally and professionally. I enjoyed Happiness. Even though I knew how it would end, I felt the suspense and stress of Gracie’s treatments and procedures and was eager to hear how it all worked out. Harpham does a really good job of letting the reader into the head of the parent of a sick child. She’s honest and genuine, sharing her innermost thoughts while Gracie was hospitalized, including the guilt she felt about neglecting her young son, her ambivalence toward her partner, and the conflicting emotions conjured by watching other parents enduring the same awful experiences in the hospital. I felt great empathy for her and for Gracie. Happiness was a compelling read and I’m glad I included it on my travels.